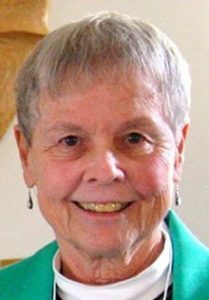 Dominican Sister of Peace Lois (Therese Albert) Laronde, OP, 83, died on December 19, 2018, at the Mohun Health Care Center of the Dominican Sisters of Peace in Columbus, OH. Sr. Lois earned a Bachelor of Arts in English from Siena College in Memphis, TN, in 1969. Her first ministry was in education; she taught elementary school children in Illinois, Massachusetts, New York and West Virginia. She took her responsibility to her students very seriously, attending summer classes and continuing education to keep herself current with changing educational practices. In the early 1980s, Sr. Lois served as Chaplain at Cushing and Bon Secour Hospitals in Cambridge, MA. Typical of her desire to offer the best to those she served, Sr. Lois returned to study at Emmanuel College in Boston and earned a Master of Arts in Pastoral Counseling. She continued teaching in Cambridge before becoming Activities Director at the Windsor House in Cambridge, then worked as an Instructional Aide at the Cunniff School. Even after her retirement, Sr. Lois continued to use her talents to aid her Congregation, volunteering at Rosary Manor. In her remembrance of Sr. Lois at the Memorial Mass in St. Catharine, Sr. Ann Bernardine Shaw recalled Sr. Lois ‘sweet and gentle smile, saying it was an outward sign of her inner self, a woman grateful for the graces and blessings of God. Sr Lois was preceded in death by her parents, Albert and Lillian McAdoo Laronde, and her brother, Albert Jr. She is survived by her sister-in-law, Jeanne Laronde. Memorial gifts in Sr. Lois’s memory may be sent to the Dominican Sisters of Peace, Office of Mission Advancement, 2320 Airport Dr., Columbus, OH 43219 or submitted securely at oppeace.org. To download and print a copy of this memorial, please click here.